This article describes how to install the OroPlatform application or the OroCRM application. Both applications are similar, but the platform contains only a subset of all bundles available in the full CRM. Follow the with the link, to see the full list of bundles available in the packages. The next steps assume that you are to install the complete OroCRM application and provide details of what has to be done differently when installing the Platform application. Please check that all the system requirements are met. OroCRM uses Composer to manage package dependencies. We recommend to install it globally. Symfony documentation provides detailed instructions on installing Composer globally. To efficiently use the assets shipped with the OroCRM, it is recommended to install node.js. Detailed installation instructions are available in the node.js installation document. 1a. Clone the GitHub repository and run the composer install command. 1b. Download the source code archive and run the composer update command. Go to the directory, to which you want to save the OroCRM folder ([$folder_location]). Use the git clone command. Specify the version to download (in the example, it is “1.10.12”). Along with 1.10.12, you can use any other released version or even the master branch to run the latest development version of the OroCRM. At the end of the composer install command, you will be asked to enter some configuration parameters in the console. The parameters are required to bootstrap the application. The asset’s version stays unchanged. A hash of the current time. The next asset’s version is the previous version incremented by one (e.g. ver1 -> ver2 or 1 -> 2). You can change the parameters in the “app/config/parameters.yml” file. Download the latest OroCRM version from the download section on orocrm.com. Update the configuration parameters if necessary. Unlike when downloading from the GitHub repository, you won’t be asked to define the parameters in the console, and default values will be used instead. If any of the parameters need to be changed, do this manually afterwards in the app/config/parameters.yml file. Use the OroPlatform download files from the download section on orocrm.com. Create an empty database, such that its values correspond to the configuration parameters starting with database_. Please make sure mod_rewrite and mod_headers are enabled. Make sure that the web server user has permissions for the log directory of the application. Make sure that options fastcgi_pass for Nginx and listen for PHP-FPM are configured accordingly. 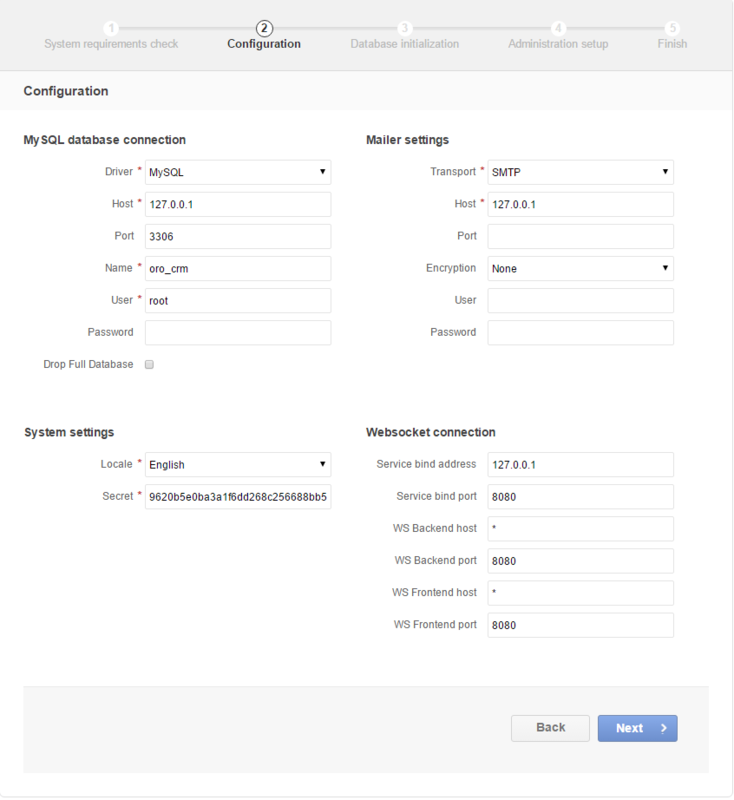 Add the “orocrm.example.com” hostname to your DNS or hosts file. 5a. Use the installation wizard in a web browser. 5b. Run the console installation command. While the use of the installation wizard is easier and more straightforward, running installation from the console provides some additional flexibility as described in the relevant section below. Click the Begin installation button. Fix any issues that have been discovered and refresh the page. 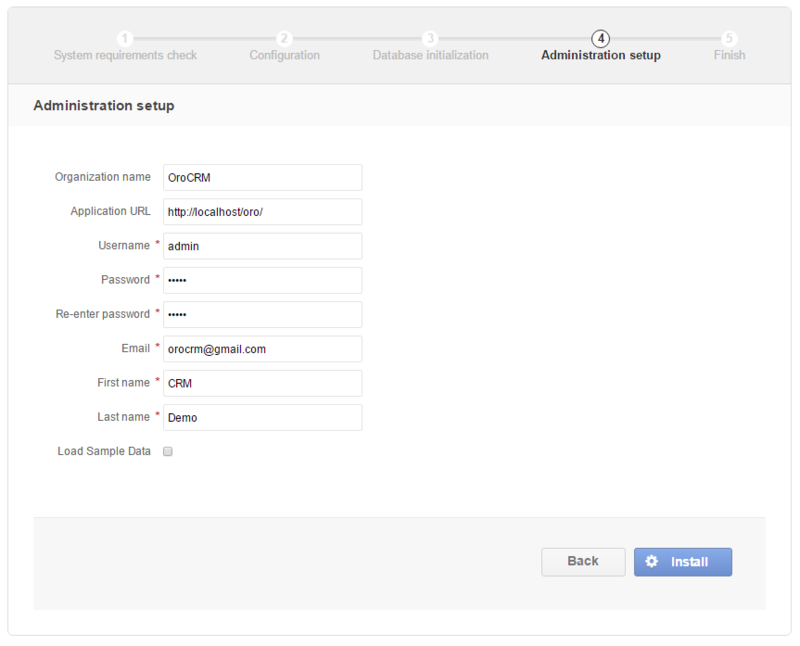 When your system configuration meets the OroCRM requirements, click Next. 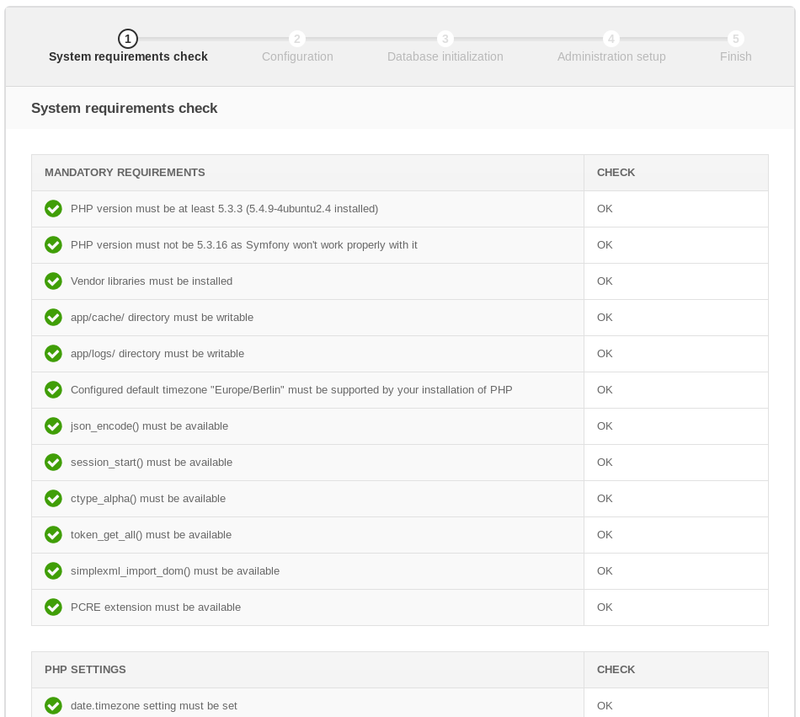 In the emerged page, specify the application configuration. The values defined in the configuration parameters will be filled in automatically, but they can be changed. When all the settings are correct, click Next. If something goes wrong and a failure occurs, you can check error logs in the app/logs/oro_install.log file. Fix the errors, click the Back button and repeat. Check the “Load Sample Data” box if you need the Sample Data. The installation will head for completion, as soon as you have clicked Install at the end of the previous phase. If something goes wrong and a failure occurs, you can check error logs in the orocrm/app/logs/oro_install. Fix the errors, click Back button and repeat. Click Launch Application and enjoy OroCRM capabilities for your business. Another way to run the installation script is with the oro:install command in the console. The “–env=prod” parameter must be defined, as otherwise the development environment will be installed. The system requirements are checked. The setup process terminates if any of the requirements are not fulfilled. The database and all caches are reset. The initial data (i.e. 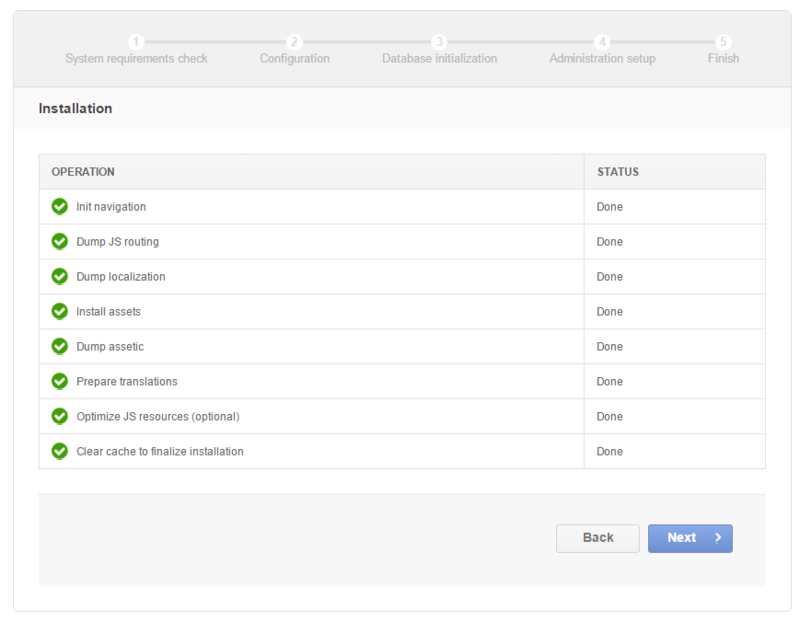 migrations, workflow definitions and fixture data) are loaded and executed. The assets are dumped, RequireJS is initialized. If the system configuration doesn’t meet the requirements, the install command will notify you about it. Fix the issues and run the command once again. If other problems occur, you can see the details in app/logs/oro_install.log file. Normally, the installation process is terminated if it detects an already-existing installation. Use the “–force” option to overwrite an existing installation, e.g. during your development process. After the installation finished do not forget to run php app/console oro:api:doc:cache:clear to warm-up the API documentation cache. This process may take several minutes. In the up(), you can modify the database schema and/or add additional SQL queries that are executed before and after the schema changes. You can learn more about custom event listeners in the Symfony documentation. Migrations registered in the oro_migration.pre_up event are executed before the main migrations while migrations registered in the oro_migration.post_up event are executed after the main migrations have been processed. 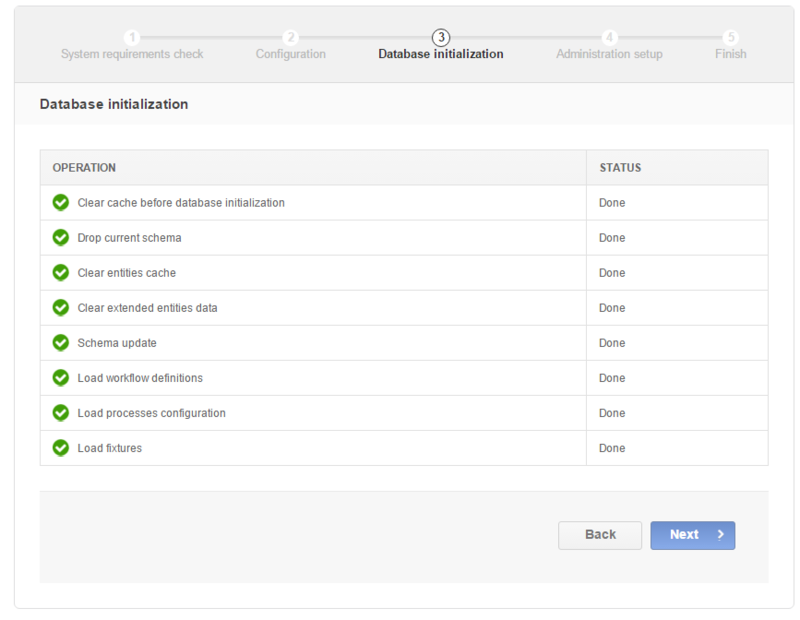 Your data fixture classes must reside in the “Migrations/Data/ORM” sub-directory of your bundle to be loaded automatically during the installation. Read the documentation to learn more about the Doctrine Data Fixtures extension. To launch scheduled execution of the operations required by the Oro application, set up a cron command with the oro:cron CLI command as an application entry point (see the sample configuration below). You can also create your own commands that are executed in the background at certain times. Read more about it in the chapter about executing cron commands. To ensure that required number of consumers keeps running, set up a supervisor. Here is example of supervisord configuration.